There really is no one-size-fits-all when it comes to refund policies. There are so many factors involved. The main one being, that Visa/Master/Amex/Paypal all give a buyer up to 60 days to ask for a refund, at least with most merchants. Unless you’ve already negotiated the refund terms with your merchant account provider, and have both specifically agreed that there would be no refunds (like say, if you were selling an expensive item, like a car, or a boat, or a service), or that it’s only going to be a 30-day refund period, then you really have no control over the refund period. You just have to comply with at least the mandatory 60-day refund period required by the credit card companies. How much should you set your refund period to be within DAP? Now remember, it is this Refund Period setting (under Setup > Config > Advanced) that also makes affiliates eligible for payment. What is the waiting period for an affiliate to get paid for a referral? That’s because if you end up paying too soon (say like within 15 or 30 days), and then the buyer comes back and asks for a refund, now you’re out-of-pocket for the affiliate commissions that you have already paid on a purchase that you just refunded. Now remember that when you do the actual refund within DAP, DAP will roll-back any commissions credited towards this purchase. If you have not yet paid your affiliates, then in the next report, it will ignore the refunded purchase, and will not calculate commissions on that purchase. But if you have already paid your affiliates (like within 15 or 30 days after purchase), then DAP will include the negative commission in the next pay-period’s report. And any future commissions earned by this affiliate will be accordingly adjusted. 2) Just swallow the loss, write it up to the cost of doing business, and move on. This can happen if you click on this URL in a browser. http://yoursite.com/dap/dap-paypal.php (replace yoursite.com with the name of your site). This is a backend script and should not be called directly via browser. But if you click on this accidently, this error can be ignored. Just make sure that the DAP and Paypal are integrated and purchases via Paypal are getting registered in dap correctly. 2) DAP Paypal IPN Error (Rejected): IPN Product Name = does not match any DAP Product Name. Make sure that the item_name in Paypal button is set to eXactly match a DAP product name otherwise DAP cannot process the payment notifications. If the notification is for a product that you sell outside of DAP, then DAP will reject it with this error message and no action is needed. Set this to “Y” if you want DAP to process non-dap defined product purchase notification from Paypal. This could be due to a problem with the CURL library on your site. With DAP 4.0, you can easily switch your site to use FOPEN instead of CURL. 4) Can I use my Paypal account to sell products outside of DAP even if the global IPN points to a DAP script? Paypal can send a notification to DAP. This one is used by Paypal ONLY if button level IPN is not set. If the button level IPN is set, then Paypal ignores the global IPN. Now, if you are selling other products outside of DAP using Paypal and for those Paypal buttons, if there is no button level IPN notification defined, then Paypal will look at the global IPN setting (which also points to dap) and send notifications to dap. But dap will reject that message because the product is not defined in DAP. That is when you receive these ‘IPN rejected’ messages and you can ignore them. 5) I have integrated DAP and Paypal per your documentation but it still does not work. a) Make sure that the Paypal button has the item_name set to exactly match a DAP product name otherwise DAP cannot process the payment notifications. 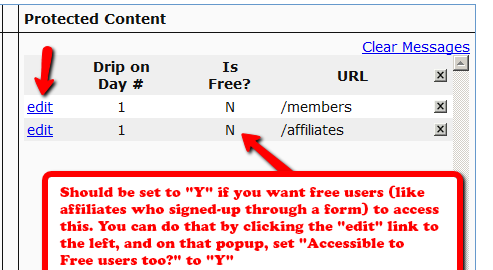 b) Button-level IPN must point to DAP script (http://yoursite.com/dap/dap-paypal.php – replace yoursite.com with the name of your site). enter the following (change the text yoursite.com below to your domain name). c) Global IPN must be enabled and pointed to the DAP script as descrbed in step 1 of this document. 6) What config items in DAP are required if I use Paypal HOSTED button? DAP Setup -> Config -> Payment Processing -> Use Paypal Sanbox For Testing -> Set to “Y”. If your site has trouble connecting to Paypal via CURL and you see this error in DAP orders page – Check Product and Price(Reprocessible), then update the config to use FOPEN. DAP Setup -> Config -> Payment Processing -> How DAP connects to Paypal –> Set to “Y”. NOTE: In the DAP Products page, you ONLY need to set the Product Price, Trial Amount and Recurring Count if you use the DAP hosted/generated buttons for Paypal. Not needed if you use Paypal hosted buttons. You can leave it empty if you use Paypal hosted buttons. Even if you populate it, it will not be used. Especially check the “notify_url” part towards the end. If you are absolutely sure that you have followed all of the steps above, and DAP is still not creating an account for the new user, it is possible that your host is not allowing your server and Paypal to communicate correctly. You can confirm if this is an issue, by going to the “Orders” page, searching for all orders, and see if your test purchase in question has been recorded by DAP (even if DAP didn’t give access to the user). If you find the order in DAP, but the user has not been created, then check with your host and make sure “fopen” or “curl” is enabled for your web site. 1) Go to Setup > Config > Dap Log Level and set it to “5”. And we’ll investigate this asap. 5) Go to Setup > Config > Dap Log Level and set it back to “1”.